Miscarriages at 7 months are actually considered stillbirths because the babies are nearly fully developed. Learn about the possible causes and risk factors for stillbirth in the seventh month of pregnancy. 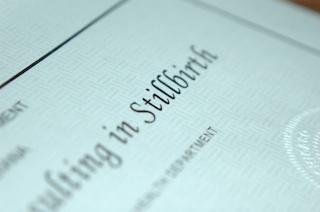 According to the March of Dimes, a number of conditions can lead to stillbirths. Some problems are common while others are rare. Genetic disorders, chromosomal abnormalities, environmental factors, or unknown causes can lead to birth defects that are fatal to the developing baby. The National Institutes of Health recognizes chromosome abnormalities as a major cause of birth defects, stillbirths, and spontaneous abortion. When a fetus grows too slowly, the risk of stillbirth increases. According to the March of Dimes, 40 percent of stillborn infants had slow growth. Problems with the umbilical cord can cut off oxygen to the baby. Problems can include knots in the cord that prevent oxygen from reaching the fetus. Placental abruption occurs when the placenta strips away from the uterine wall. This condition threatens the life of both mother and baby. Infections can threaten the life of a developing baby. The following health problems in the mother can lead to stillbirth. African American women are at a higher risk for having stillbirths than Caucasian women; the reason for the increased risk is unknown. Some miscarriages and stillbirths can't be prevented, but women can take proactive measures to ensure that they are less likely to experience such a tragedy. Women who are at high risk should begin taking preventive measures before becoming pregnant. This begins with a visit to a doctor who can offer a viable plan for a healthy pregnancy. The Global Alliance to Prevent Prematurity and Stillbirth offers resources for parents dealing with pregnancy problems around the world. The program seeks to find treatment strategies and preventive measures that parents and medical professionals can use to lessen the number of premature births and stillbirths. In spite of efforts, some miscarriages at 7 months are unavoidable and parents may feel that they can't grieve a baby they never had. A loss of a child, no matter what age or cause, is a source of considerable grief. Finding help and support can make the grieving process easier. Mothers often create strong bonds with their babies from the moment that they find out they are pregnant. The idea of losing a baby anytime during a pregnancy is a source of fear for many expecting parents and a loss in any stage is detrimental. Miscarriages at 7 months are grievous and couples dealing with this type of loss can find support.